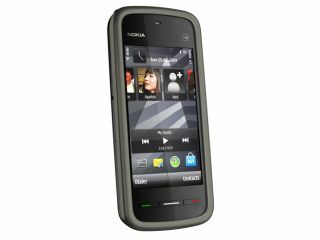 Nokia has decided the touchscreen game is actually worth getting into, and has released another touchy device, the Nokia 5230. This is going to be another in the mid-range line for Nokia, following on from the 5530 XpressMusic, and is essentially a 3G update of the phone, coming in at a similar €149 (£130) price tag. The 5230, while bringing the HSDPA super speed update, also has a much improved battery to compensate, with a 1320mAh effort giving 19 days standby time and up to 33 hours music playback. However, it only has a 2MP camera without flash, and the 3.2-inch touchscreen is also resistive, although it didn't hamper the functionality of the 5530 XpressMusic too much. There's no memory card in the box either, so for a similar price to the 5530 you're pretty much just getting better battery life and a 3G connection. There will be Comes with Music versions for 'selected markets', but Nokia couldn't confirm to TechRadar that the UK will be getting such an edition (and even if we do, it seems unlikely we'd be among the first after the 5800 XpressMusic delay earlier this year). It will be shipping in Q4 apparently, so might be worth a Christmas look if you fancy forking out for a touchscreen for a loved one.